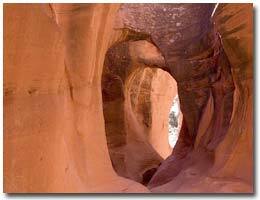 Slot canyons have their draw on me. I do not understand all of the reasons why, but they tend to be a place of their own, completely unlike the feeling you get when only a few feet away in the desert. They are compelling in their own way. After we struck camp up on Egypt bench, we drove south to a spot where we would hike into two well known slots for the fun of it as our recent few days had been full of hard hiking, You start up on a rim and make your way across the slickrock and down. 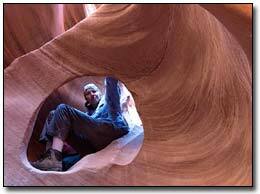 Once down in the wash, the first slot you come to is Peek-a-boo and is about a 15’ climb up into a hanging slot. We continued however, waiting to enter this slot from its source later in our day’s journey. 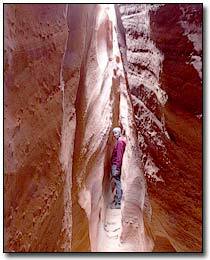 Our first target was Spooky, a nice long, very narrow slot a bit further down the main canyon. As we rounded a huge sandstone feature, we saw the walk-in entrance to Spooky. This would prove to be the narrowest, long slot we have ever walked. There are a few places that slightly widen but mostly you will see extremely tight walls that soar way up with none to little sky visible. The tight twists and turns are not for people who do not like compressed spaces. You cannot wear your pack, no matter how small it is. You carry it beside you and that goes on for 1/3rd of a mile. Now 1/3rd of a mile does not seem like much when you are cruising down a normal trail but it seems to go on forever in a slot this tight. The image below was in a moderately tight place as it was impossible to set up the tripod in many of the very tight spaces. The exposure was 10 seconds at f/11. That is how dark it is down in the bottom. From Spooky we went cross-country, though we had been advised not to by the ranger doing the permits (some folks get lost out there), until we found upper Peek-a-boo and dropped down into it. It was very tight as well with some very wild twists and turns but not as deep at the top. It travels about a quarter of a mile but again, it seems much further. We saw one snake that may have been a faded midget rattler. It slipped under a rock, which we stepped over. We noticed several places to climb up to the rim in this slot. The walls became higher as we went downstream and near the bottom, we found some stunning works in the rock carved by water over the millennia. I shot the image below through another hole from a very awkward position. Neither of these have any extremely technical portions but there are some slightly difficult areas which are not easy to negotiate. If you are much over 200 lbs, you may have a hard time getting through Spooky. These are popular slots as they are easy to get to. The place is not Disneyland though so come prepared with plenty of water, maps, navigation tools and the normal gear you would need when being “away”. From Peek-a-boo, we again traveled cross-country for a while, observing things that most visitors rarely see and then found our way back. 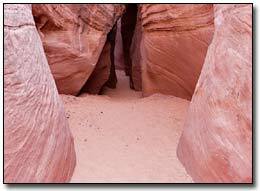 If you ever find yourself in the Escalante Grand Staircase, these two slots are a great intro. Stop in Escalante at the BLM ranger station and get free permits into the area and good directions to these slots as well as other canyons and features. There are endless places you can explore that will never be in any guidebook as the area is absolutely vast. You will see other people but as you go into the canyons most will disappear. Only a handful will come here compared to Zion and Bryce. Most are going to be hikers and backpackers with only a smattering of casual tourists. No junk shops are in site for many, many miles out here. Of course, we had our annual dinner at Cowboy Blue’s in the tiny town of Escalante for the great food and the fresh chocolate brownie sundaes, one way to try and replenish the burned calories lost in a week of this type of adventuring.